The stylish and spacious new Audi A7 has been advertised by the company as an alternative to the Mercedes CLS but is completely different in concept. The stylish new A7 is loaded with technology and all the equipment has been extensively tested in the A6. There is a limited selection of engines, all 3.0 litre, and an option for the four wheel drive quattro. The three specifications are the Standard (entry level), the mid range S line and high end Black Edition. All specs are comfortable and good to drive with the Black Edition offering the most powerful performance. 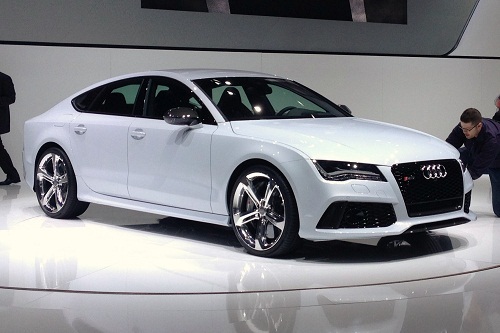 The RS7 edition achieves 0 to 62 mph in an impressive time of 4.7 seconds. Audi has sought to reduce the weight of the new A7 so has used 20 per cent aluminium in the construction of the body shell. It is still a big car but this reduction in weight has improved the handling. The optional four wheel drive quattro makes it even better particularly in slippery conditions. Steering is not as agile as in the Mercedes and this makes it less fun to drive, but you can alter the control and suspension settings to suit your own specific requirements. For high performance you should choose the Black Edition or S line. Inside the cabin of the A7 it is stylish and the wrap around dash looks spectacular. All instruments and dials look good too and in the rear of the car it is like sitting in a luxury limousine. Leg room is excellent and head room is good although adults over six feet might have a slight problem which is caused by the sloping roof. However, the style outweighs these minor glitches to comfort. Audi has also added the option of an acoustic windscreen which filters out extraneous noises from the road, the wind and the engine. Audi usually scores high for reliability and this car has yet to be tested but it is expected that as it is based on the A6 there will be no problems. The company itself sits at 10th position for reliability in customer satisfaction surveys. This is an improvement of five places on the 2012 figures. The many safety features incorporated in the car include front, side and curtain airbags, tyre pressure monitoring and stability control. Safety features that can be added as extras are adaptive cruise control, night vision and lane assist. This four seater model has a lot of space and this includes the boot which holds 535 litres of luggage. This can be increased by folding down the seats to make it 1,350 litres. The boot is shallow but extends back a long way. Storage inside the cabin is also extensive with lots of cubbies and door bins. Style added to practicality is the order of the day in the new Audi A7 and this can be matched by purchasing a set of car mats which have been specially designed for this beautiful car. The quality of the mats will match the quality of design and build that Audi brings to every model. In addition, car mats from specialist retailers are much more affordable than those offered by the dealerships and match the design and quality in every way. A set of car mats will enhance the cabin of your new car and will make every journey more comfortable and enjoyable.